What’s better than a little afternoon Moroccan Mint Tea? How about a Moroccan Mint Tea AND a nicely prepared Shawarma from Marrakesh Express! This restaurant-turned-food-truck is definitely doing the shawarma right! What’s a shawarma, you ask? Much like our favorite late-night snag in Germany, the doner kaboab, a shawarma is a pita wrap stuffed with rotating roast meats, usually lamb, beef or chicken. The meats are roasted on a rotating vertical poll that is then sliced off to be stuffed in your shawarma wrap with a range of condiments and veggies. There are age-long discussions about the difference between a doner kabeb, the shawarma, and even the gyro…but I’m a lover, not a fighter, so I’m not getting into it. As far as I’m concerned, they’re all delicious! 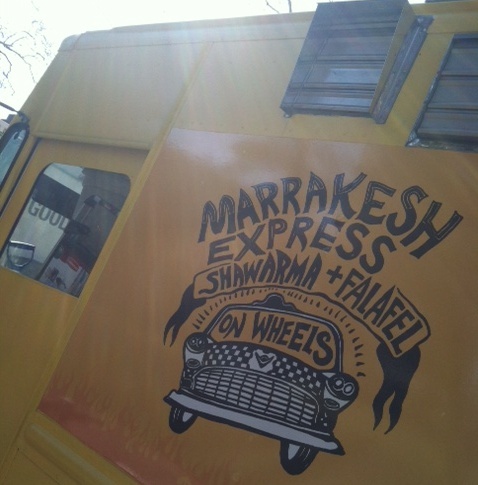 I checked in with Marrakesh Express, the awesomely yellow food truck stationed at 40th and Spruce in West Philly. 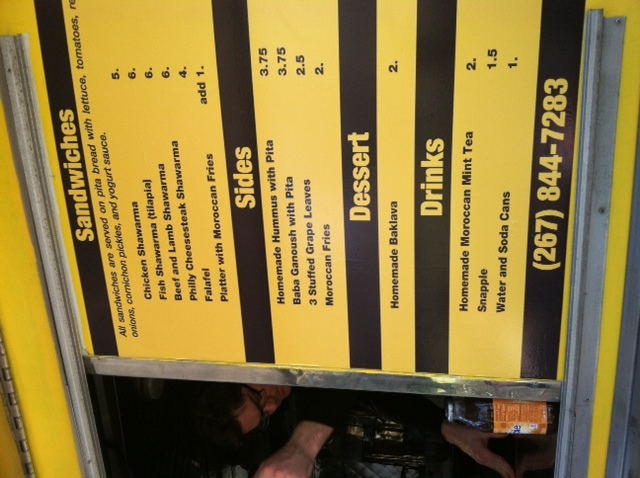 This halal, Moroccan food truck has a straight-to-the-point menu: they mostly have shawarmas, so get a dang shawarma! Upon my arrival, I was offered Moroccan Mint Tea by the very nice gentlemen operating the truck. I would definitely recommend grabbing this tea with your meal, as it provides a nice flavor balance with a shawarma. Earthy, sweet and refreshing! Great for our global-warming influenced spring days here in Philly. So, for today’s Bite This! series, I invite you to bite into the Marrakesh Express Chicken Shawarma. Served with lettuce, tomatoes, onions, pickles (nice surprise) and a yogurt sauce, this succulent, perfectly-sized and seasoned, Moroccan banger will definitely make you want step up your Moroccan cuisine game! 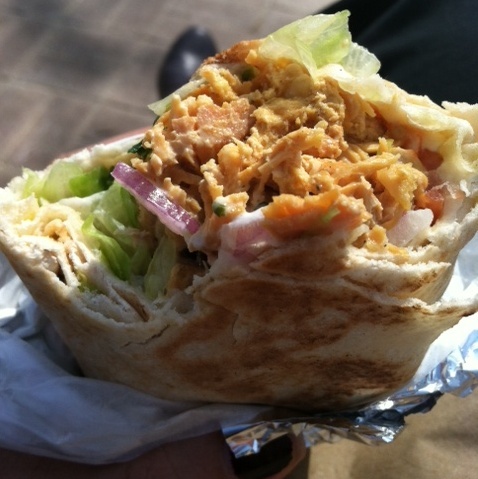 This entry was posted on Wednesday, March 28th, 2012 at 11:30 am	and tagged with Chicken Deliciousness, Food Trucks, marrakesh express, Moroccan Cuisine, Quick Bite, Shawarma and posted in Bite This, Food Trucks. You can follow any responses to this entry through the RSS 2.0 feed.